I had two bookings one through Booking.com and the other one was through my office for two more nights and they checked me out even though listing on reservations list and had to approach again for reactivate my card. Receptionist, service disk and the restaurant. Gym and swimming pool. Close to city star mall and clean . The staff are friendly. Holiday Inn Citystars This rating is a reflection of how the property compares to the industry standard when it comes to price, facilities and services available. It's based on a self-evaluation by the property. Use this rating to help choose your stay! One of our top picks in Cairo.This modern, family-friendly hotel is located in the center of the Citystars business and leisure complex and just a 10-minute drive from Cairo International Airport. Holiday Inn City stars offers free WiFi in public areas. 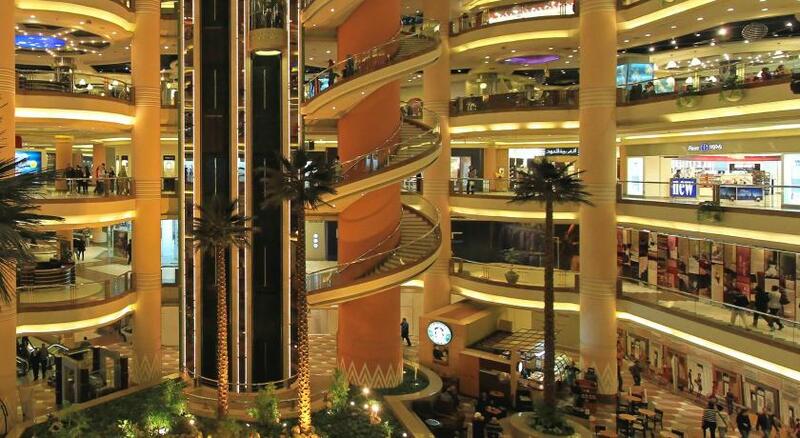 Magic Galaxy, Egypt's largest indoor theme park and downtown Cairo are both a 24-minute drive away. 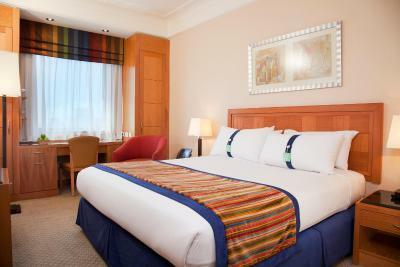 The spacious rooms of Holiday Inn Citystars feature flat-screen TV with satellite channels and tea/coffee makers. Rooms on the upper floors offer panoramic views over Cairo. The Holiday Inn’s restaurants serve a variety of cuisines. From the rooftop garden to the Star Corner Café in the lobby. Open 24-hours, Windows Restaurant tempts hungry diners with heaped international buffets and live cooking stations. Indira Restaurant serves an authentic Indian culinary experience. After a day of shopping at Citystars, guests can relax in the outdoor heated pool. There is also a state-of-the-art fitness center. Holiday Inn Citystars is a 10 minutes from Cairo International Conference Center. On-site car parking is available. 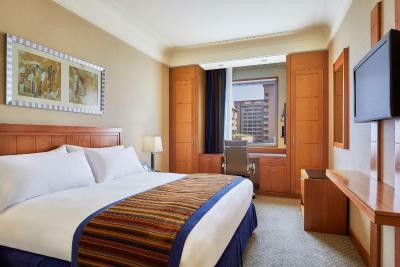 When would you like to stay at Holiday Inn Citystars? - 1 rollaway bed allowed. - HSIA LCD TV screen. - Bed type and smoking preference allocated at time of arrival. - Room is equipped with free luxurious toiletries, Slippers, bathrobes & hairdryer. House Rules Holiday Inn Citystars takes special requests – add in the next step! Holiday Inn Citystars accepts these cards and reserves the right to temporarily hold an amount prior to arrival. The Hotel is ideal for a businees trip a nice hotel located right next to a very nice shopping mall. The service was excellent from check in to check out. The breakfast had a great selection and a warm greeting from every member of staff encountered. The bed was very comfortable and the room provided everything for my needs. Dry cleaning service was fast and efficient. Good choice of food and a bar and outside shisha area. The gym is small however, caters for most requirements and there is also a small swimming pool. I will return to this hotel when on business. Bed n breakfast are great, for sure the location is best. Need to highlight the wifi is totally good enough! Missing of Zaatar in the breakfast. Water accumulation in bathroom. Broken toilet spray in common bathroom. None of the Uber trips were able to reach to Hotel Reception entrance for Holiday Inn City Stars as booked and needed to give a call back from roaming number to guide them to reach to Holiday Inn City Stars Entrance instead of other hotel entrance. Reporting to update the maps and locations only..